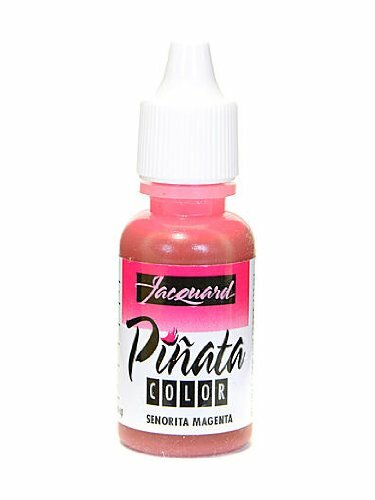 Piñata Colors, developed by artist Susan Pickering Rothamel and Jacquard are indelible, intense, color saturated, transparent, acid-free, alcohol-based colorants. Use these vibrant colors in a variety of applications, including leather and marble-like faux finish backgrounds, rubber stamping, fiber arts, calligraphy, glass painting and airbrushing. Use Piñata on paper, glass, plastic and metal just to name a few surfaces. Highly adaptable, these colors can also be mixed with a variety of other products to produce unique color blending. 1/2 oz. squeeze bottles. Use with Piñata Color Clean Up Solution and Piñata Claro Extender , both specifically designed for use with Piñata colors. Sold as PACK OF 4.